The number of calories burned hiking depends in part on your body weight. In general, a 160-lb person burns between 430 and 440 calories per hour of hiking. A 200-lb person burns approximately 550 calories per hour of hiking. The more you weigh, the more calories you burn in an hour of hiking. In a study published by the American Council for Sports Medicine in the journal Medicine and Science in Sports and Exercise, researchers found that a high exercise intensity increases your calorie burn even after your done with the activity. When you hike at a high intensity for 45 minutes, you'll burn an additional 190 calories later in the day. Your metabolism increases with a vigorous hike and the extra calorie burn lasts for an average of 14.2 hours of after your done, and it can continue through the first 3.5 hours of sleep. The number of calories burned in an hour of hiking also greatly depends on whether you are carrying a pack and, if so, how much it weighs. Carrying a light load, such as a day pack, you will burn between 50 and 100 more calories an hour than with no weight. 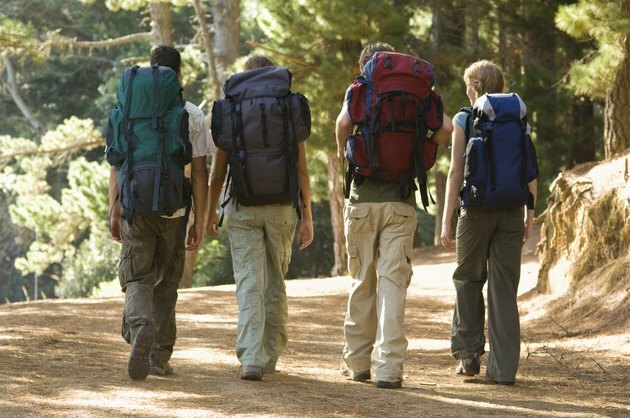 With a heavy load, such as for a long backpacking trip, you will burn up to 200 more calories an hour. Terrain also plays a large part in how may calories you burn hiking. Since terrain varies so much, it is impossible to say exactly how hiking in a specific area will change the number of calories you burn. For example, you will burn more calories walking on flat, rocky ground than on flat, grassy ground. However, you will burn more calories walking uphill on grass than flat, rocky terrain. Generally, if the hike is challenging, you will burn more calories.